Not much ever flustered Johnathan Thurston on the field, in a decorated career that included an NRL premiership, State of Origin and World Cup victories and multiple individual honours such as Dally M and Clive Churchill Medals. But the future rugby league immortal has admitted to be overwhelmed as he prepared for his final match after 17 seasons in the NRL. Thurston farewelled rugby league in winning style as he helped orchestrate the North Queensland Cowboys’ come-from-behind 30-26 win over the Gold Coast Titans in Robina on Saturday night. It was not the fact that his career was coming to an end that left the 35-year-old struggling emotionally, rather it was the response from the rugby league community that left him stunned. 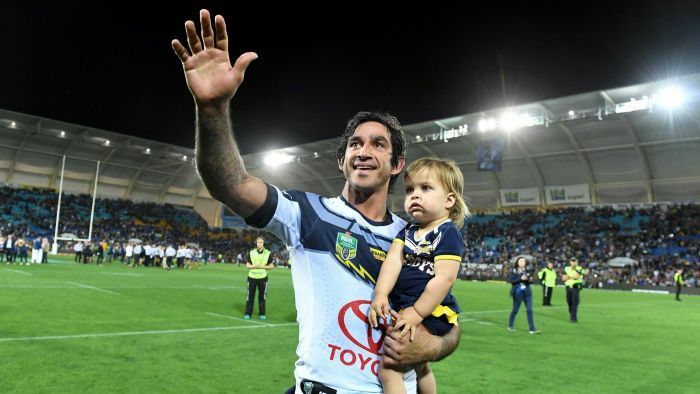 “The last couple of months have certainly been an overwhelming and humbling experience,” Thurston told ABC Grandstand. A bumper crowd of 26,681 in Robina helped Thurston feel even more humbled as he played his final match before entering retirement. Numerous fans travelled down from North Queensland and others came from interstate, including Thurston’s long-time Queensland State of Origin ally Cameron Smith, who paid his respects less than 24 hours after playing for the Storm in Melbourne. Smith stood alongside Thurston’s family as he made his way onto the field with his three children, with the pair embracing amid the rapturous applause of the crowd. It says a lot about Thurston’s impact at the Cowboys that the way he has conducted himself away from his playing duties is highlighted as being his greatest attribute. Coach Paul Green, who linked up with the Cowboys in 2014 before guiding the club to its historic premiership the following season, spoke glowingly of Thurston’s caring nature. “If there is one thing I can say about Johnno, we all know how great he is on the field but it is his demeanour and the way he carries himself off the field,” he said. Likewise, Matt Scott was full of praise, noting the respect Thurston has earned from opposition players and supporters. “Everyone loves him. He gets support everywhere that he goes,” he said. Scott, who also played with Thurston for Queensland and Australia, said he was going to miss playing with his popular teammate. “I’ve been blessed I pretty much played my whole career with him,” he said. Another Cowboys teammate, Gavin Cooper, was the recipient of some Thurston on-field magic against the Titans when he scored following a brilliant cross-field kick that helped put the visitors in front on the scoreboard. Cooper has had reason more than once in his career to be grateful to have played alongside Thurston and he touched on the impact his retirement will leave on the NRL. It’s a strange one, it is a sad day not just for us but for all rugby league fans,” he said. For Thurston, coping with life after rugby league does not seem it will be an issue, as he is excited about spending more time with his growing family and continuing his work in the wider community in North Queensland. That’s where I call home, North Queensland,” he said. Next articleHave your favorite Netflix shows been renewed or canceled?